And, before anyone asks … The company did NOT pay us to write this post, and YES we paid real US dollars to buy the guitar rack. I’m much more apt to strum around when I can see the instrument, and it allows me to put the case away under the bed or in a closet. Humidity changes can have a disastrous effect on stringed instruments, which is why we recommend keeping instruments in cases (with small Dampit or Oasis Humidifiers) when not in use. What is the difference between this and a unitasker? Steve — A unitasker has very low utility. An item may only have one purpose, but as long as it has high utility, it’s not a unitasker. For example, a toilet and fire extinguisher only have one purpose each, but they are most certainly not unitaskers. How cool is that! Looks great. Okay gang, we get it, you’re all in grumpy moods today. This is a simple reminder that comments exist on our site to help others. If your comment doesn’t provide an alternative product or solution or an explanation or something to benefit the community, we’re going to delete it. Ask yourself, “Does my comment benefit people trying to organize the instruments in their homes?” If the answer is, “No,” then delete it. If the answer is, “Yes,” please hit submit. We’ve already deleted a number of snarky comments, and my hope is not to spend the rest of my day playing referee. just have to say…your house must be wonderful with all that musical talent- and I LOVE the shade of green on that chair! Wow – so it’s OK for you guys to be rude and condescending, but NOT ok for your readers to call you out on it? The peg rack might work, but you would probably want to put something on the floor to keep the cases from sliding down the wall. A bookshelf is a shelf to store books. If you have books, then you need a way to store them appropriately. For those who have a number of guitars, this is no different. Polly – yep. It’s her website. If you don’t like what Erin writes you can read someone else’s website. I’ve never seen anything here that I would characterize as rude OR condescending, but then I am not a HSP (highly sensitive person). I think Erin is reminding us that *her motivations* are not subject to analysis and interpretation based on *our moods. * And I think she is perfectly within her rights to so remind us. 1) My sympathies! It can’t be fun to read all that grouchiness. 2) Explanation (highly unscientific…make this “speculation” not “explanation”): Is it the weather (low barometric pressure or something??) and tension anticipating the hurricane? Or general uneasiness following the earthquakes (east coast & Colorado) on Tuesday? Of course, I can’t assume that all posters are east coast or Colorado/Arizona residents. 3) One more speculation: end-of-summer blues? Okay, enough aimless prose from moi. I hope the bad humor blows over soon. This is great- my husband has a music room in the basement that is a guitar graveyard. He has lots of stands holding many guitars and guitars propped up randomly. This would be a good way to consolidate them. We also live in humidity central so I will mention that to him- I’m not sure he’s aware of the damage potential. I like it! Especially since it is made in the USA. Personally I like the idea. I wish I had more space in my living room for something like this. It looks pretty sturdy and you wouldn’t have to worry about the kids knocking it over like you do with the single guitar stands. @Polly — I don’t see any rude comments currently in this comment thread. I deleted all of the rude comments from readers, and I don’t see anything PJ or I have written in here as rude. We don’t call anyone names or make fun of anyone. Mostly what is here are explanations. I even see a smiley face in one of PJ’s comments … that is hardly rude! This is a really nice idea, especially for people dealing with a number of instruments. I have one kid taking violin and the case just does not want to settle nicely into any one spot. I would really prefer to have a way to keep the violin out so she would see it and practice more. But also out of little brother’s reach. Honestly, Erin…This is meant for you, because it will be deleted…but it’s meant to be kind: you have a blind spot when it comes to unitaskers for musicians. It’s ok. Sometimes, unitaskers can really be a good thing for specialists…musicians, carpenters, etc. Admit this to yourself, have a sense of humor about it, and it will add to the discussion of what and when clutter happens. Acknowledgement will also have the added bonus of rendering the comments calling you out about it less stressful. Love this product! It’s amazing what items are out there these days. Thanks for sharing. I had my hubby make me something quite similar a couple of years ago to contain my instruments (and I have mine arranged from largest to smallest as well, interestingly). It’s not fancy enough that it will pinch-hit for a guitar stand, but it does the job and has a couple of little drawers for storage underneath. Here’s a link to it (sorry the picture isn’t super): http://ourlittlek.blogspot.com/2008/08/nice.html. Do you want to know why people react badly to this story? Its because your blog is about uncluttering and you post about and advertise a $ 450,- piece of mostly useless furniture. How many people may possibly be interested to read about an “Guitar-Suitcase-Holder” the size of an baby elephant – on the UNCLUTTERER Blog? I think some of you need to understand what uncluttering is really about. Uncluttering is not about deprivation! It’s about having what you love around you in a peaceful manner. A person that is creative needs/must have their supplies around them. For some that’s a computer, for others it’s a sewing machine, for others it’s instruments. It’s only logical to have a place to store them. It’s really none of our business how much that storage costs if it fits the user(s) needs. Do some of you think that a $4.50 plastic tub is better than a crafted piece of furniture? It baffles me. I was interested to read about the issue of humidity and guitars, as I was planning to use a wall mount for my son’s electric bass. I think it will look cool on the wall and it will get the instrument off the floor. However, we live in East Coast humidity. Is humidity a problem with electric instruments as well as acoustic? @ Johnny Hitler – “the size of a baby elephant” – seriously? Come on, dude! Get over it! It’s the size of a small bookcase! It’s a high-quality, solid piece of storage furniture that looks very nice in a living room or den or bedroom – it’s much better than some POS particle board thing or something plastic. She is storing 5 musical instruments that probably are very expensive! Don’t dog somebody for storing their special musical instruments in a nice piece of furniture. Just because this is an organizing site called Unclutterer doesn’t mean people are supposed to buy cheap, tiny storage units. Duh. baby elephants are not so big as you maybe think. Actually I took the time, just for you, and rode on my hippo over to my elephant stable and measured. And as fate turns out, at least MY baby elephant is _exactly_ the size of this nice piece of guitarcase-storing-equipment. As you see, I am and allways will be, the peak, the pinnacle of seriousness. And, because you asked so nice, I will gladly come on and even get over it. Please tell me beforehand over what exactly you want me to get. I hope you mind not if I correct you on one small matter. She is not storing guitars in this nice piece of furniture but guitar cases. You cannot store guitars in this nice piece of guitar-case-storing-furniture directly as it seems. So if you actually want to use any of your instruments you will have the joy of having to handle big and often handy guitar cases. And you will have the joy of being able to look at big, handy and well traveled “charakter” guitar cases, while you sit in your living room. This frees one of the burden of having to look at the guitars directly, which may not always be pleasant and sometimes may be even troublesome. In my living room the temperature year round varies between 18 and 22 degrees. And air humidity is in between 55 and 65 percent. So under this extremely volatile climatic conditions it is understandable to the utmost, that you want to protect the guitar from the guitar-destroying climate of the living room. Now I even envy the guitars fortunate enough to be able to afford living in such nice an environment while I have to endure the extremest climatic hazards imaginable. As a professional organiser I look for products that will FUNCTION well for my clients. Very often I look to this blog for new and unique products such as this guitar rack. My son only has one guitar but I know his instructor has many. I could also see this rack being used in the studio waiting room. Students could place their instruments safely in the rack while waiting for lessons instead of leaving them on the floor for us to trip over. I like the fact that the product supports both guitars and cases. This is not a feature available with typical guitar stands. One more post in support of this for an individual music player. It is quite possible for a single person who plays guitar regularly to have many guitars in different types (acoustic vs electric) and sizes, etc. My husband has many, many guitars but he uses them all and storing them truly is a problem. I would not have believed a guitar player would need more than one guitar at a time as I am not a musician, but it’s true! Well, the noise level seems to have dropped off. Thanks very much for the information. I am a guitar player with three guitars: a dreadnought, an OM, and a Seagull S6 as a beater. I keep the first two in their cases, and the Seagull in a gig bag. If the company made a smaller piece that held only four guitars, it would be perfect for me. By the way, no one seems to have mentioned the problem of lack of humidity, which leads to woods drying out. That will often cause more problems than too much humidity. 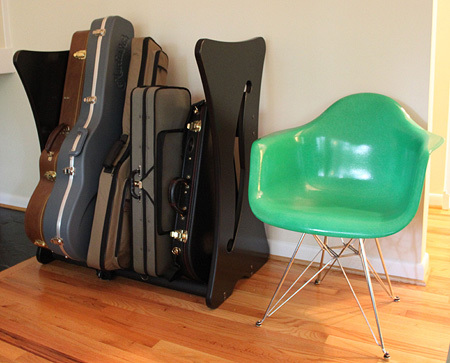 That’s a stylish way of storing guitars. That would be a nice piece of furniture in a living room or music room. I really like to have one of this item. I love the design and style, really cool.